Sea walls are what most people think of when asked to identify a form of hard engineering used for coastal protection. When they are used they tend to be very obvious,large features that are hard to miss. They are an expensive solution but, if constructed well, have a life span of up to 50 years and are effective at totally stopping erosion. Althought they tend to be very obvious and quite unattractive, many people like them. This is usually because the walls look strong and effective, so people are re-assured by their existance. Sea walls are usually made of concrete, although occasionally they are build from brick or stone. Whatever the construction material, they are designed to be strong, impervious and able to withstand a heavy battering from waves. They require constant, expensive, maintenance to repair damage to the wall, fill in cracks and ensure that they are not undercut. Designs vary according to the situation and what the wall needs to do. Some have a rampart on the top to protect perhaps a road or path from spray, and to keep people away from the edge. Others have a flat top to make access easier, for example in a fishing harbour or in front of beach huts and other tourist amenities. Whatever the design, the purpose is to protect the coastline behind the wall by stopping the waves from reaching it. Entirely ertical sea walls experience the full violence of waves crashing against them, and are vulnerable to undercutting. Consequently, many walls are designed with a slight slope toward the sea at the base. This allows waves to run up the slope, losing energy as they do so, before hitting the vertical section and being bounced back down the beach. Disadvantages of sea walls are that they may cause more erosion further along the coast due to a process called beach scouring. As waves are deflected they scour the base of the wall and erode a trench in the beach at its base that can continue down the coast beyond the end of the wall. They can also be very expensive to build and maintain. They can reduce access to the beach so may be unpopular with tourists and local people employed in the tourism industry. In areas where wetland exist behind the beach the construction of a sea wall may damage or destroy the wetland ecosystem by stopping the flow of water and sediment in and out of the wetland. 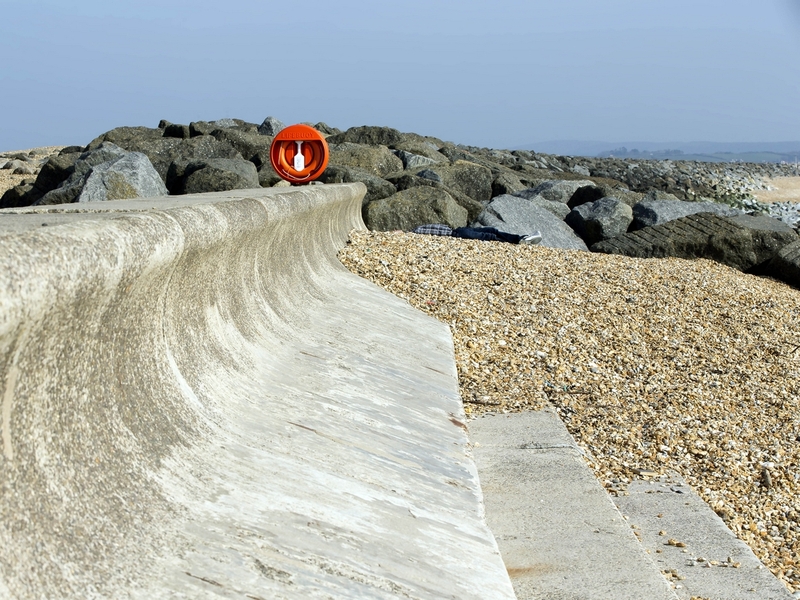 This section of concrete sea wall on the English South coast, has been designed to protect the land at the top of a shingle and sand beach. Storm waves at this location can be violent, so the wall features several ways to reduce the power of the waves. Firstly it is tall, around 5m from top to bottom, so it can cope with larger waves, even at high tide. 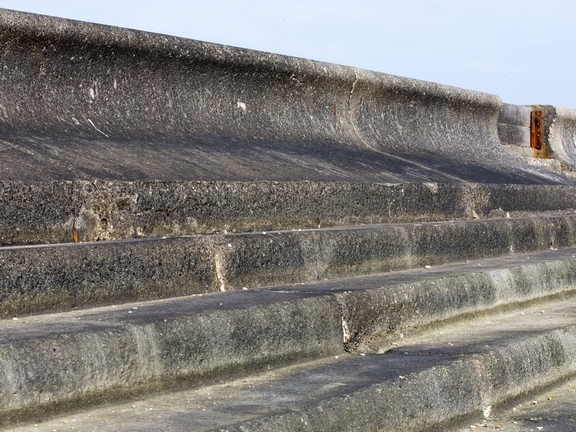 Secondly it is built with steps, each step helping to reduce the power of the waves as they run up the base of the wall. Thirdly, the top section is concave so waves run up it and are deflected back down the beach. The curve also helps to stop water breaking over the top of the wall. Finally,it has been built with removal flood barriers at intervals. If the sea does get over the wall,or shingle is thrown over the top,the barriers can be removed to allow the water and shingle to run back onto the beach. To deflect stronger waves, the top section of many sea walls is concave, with the bottom sloping down toward the beach. As waves run up the wall they are pushed up and folded back onto themselves, creating backwash that interferes with the next wave, and reduces it’s force. In this photograph you can see shingle deposited by a previous storm, and riprap beyone the wall. Don’t worry about the body;he was asleep not dead!